The Chuck Keiper (rhymes with “viper”) Trail (CKT) is a long-distance backpacking trail that is lightly used and goes through some of the wildest and most visually arresting public lands in Pennsylvania, offering remarkable solitude. It was built starting in 1976 by the Pennsylvania Bureau of Forestry, aided by federally funded Title X workers and the Youth Conservation Corps. The trail is named for the late district game protector for Clinton County, a dedicated conservationist. The only access to the trail is via PA 144, through the eerily unpopulated and lonely plateau between Renovo and Snow Shoe. The orange-blazed CKT passes through or near two natural areas and two wild areas. The trail system is divided into two loops—the West Loop of 32.9 miles and the East Loop of 22.4 miles—creating three- and two-day backpacking options. The two loops share a cross-connector trail, and the ultimate backpacking trip that does not use the cross connector would be 49.3 miles in length, though you should not avoid this scenic portion of the CKT system just because it is a connector trail. Some stream fords are still required, although recent sidehill work has reduced them substantially in the area of JU Branch, Burns Run, Boggs Run, and Yost Run. Much of this work has been done in recent years by Keystone Trails Association trail crews. Additional bridges were added in the East Branch area in 2007, and short access trails are planned to reach vistas over Dennison Fork and Fish Dam Wild Area. At the time of this writing, a new path known as the Garby Trail has been planned to connect the northern section of the Chuck Keiper Trail East Loop with the Donut Hole Trail at Hyner Run State Park, far away on the other side of the West Branch of the Susquehanna. 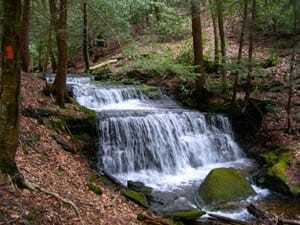 Two particularly lovely portions of the CKT, Yost Run, which has an outstanding waterfall, and Eddy Lick Run, with historical interest, are described in 50 Hikes in Central Pennsylvania (2002), by Tom Thwaites. In Yost Run, the CKT has been rerouted onto sidehill above the stream to eliminate multiple wet crossings. The former route along the run is now a blue-blazed side trail open to hikers seeking an especially challenging and scenic route. The most rugged parts of the trail are in the north and west, particularly in the Boggs Run area. The central cross connector passes through East Branch Swamp Natural Area, and the East Loop passes the southern tip of Cranberry Swamp Natural Area, which features a little-used but rewarding loop side trail. A striking and fascinating characteristic of the Chuck Keiper Trail system is the high plateau areas that lack an overhead forest canopy. The oak leaf roller destroyed much of the area‘s oak forest in 1968–72. The monster tornadoes of May 1985 and the disastrous Two Rock Run fire of April 1990, caused by careless burning at a hunting camp and destroying almost every tree over a 10,000-acre area, also damaged the health of the forest. The fire also necessitated a major trail relocation almost completely out of Fish Dam Wild Area. The high elevation of the plateau slows the growth of new trees, though some areas of the forest have recovered noticeably (yet very slowly) since the 1990 fire. The usual starting point for the CKT is 24 miles north of Snow Shoe and 10 miles south of Renovo, on PA 144 at the parking area across from Swamp Branch Road. Other trailheads are found along PA 144, with limited nearby parking, and there is a parking lot at the trail crossing of DeHaas Road (southeast of PA 144) next to a historical marker. Camping is prohibited in the public watershed between Pete’s Run Road and Dry Run Road (just west of Boggs Hollow) and in the two natural areas. Camp at least 200 feet from roads, streams, and leased hunting camps.